Sunêlia Prestige 4/6 pers. 2 bdrms. 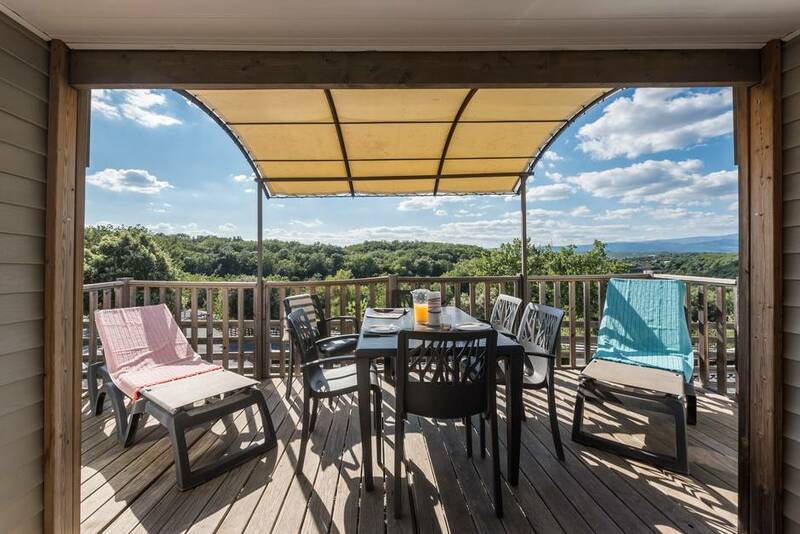 This mobile home with covered terrace named Sunelia Prestige 4/6 People is a perfect shelter for lodging when you visit the Department of Ardèche. You can rest in peace during the pauses between visits and outdoor activities in this territory. This cottage model has the capacity to accommodate 4 to 6 people. So you can book it if you travel with your family or friends. It is not only spacious but also well Equipped. In fact, it has everything you need for the stay to be comfortable. It includes furniture including cosy bedding, various appliances and several rooms. As already said, this mobil-home has several rooms. It has a total of two rooms including one with a double bed of 160 x 200 and another with a bedroom with two single beds. The last two people who stay in this small house can convert the bench that is in the living area to bed two beds. For customers and clients who want to cook their own meals, they have a spacious kitchenette. It is equipped with baking plates, refrigerator and several other appliances that make it possible to prepare food. The dining area is right next Door. It includes a table and chairs sufficient for all residents. To further facilitate the lives of the tenants in this Sunêlia Prestige 4/6 people, A dishwasher is made available to Them. In this type of cottage, there are two Bathrooms. They all have a shower, a sink and a toilet. In the Sunêlia Prestige 4/6 people, One is entitled to a TV Station. It can be put either in the living room or in the room reserved for the Parents. So everyone can find themselves in front of the TV to watch a series, a movie, a sports show etc. Outside the cottage, there is a covered terrace on which you can relax when you do not want to go out somewhere else. Garden furniture is installed There. You can eat there or play social games together. It is also possible to use a safe if you have valuable items or large sums of cash during the Holidays. In addition, this mobil-home has an air conditioning to activate when it is hot and a heating when it is cold. You can keep a temperature that is always ambient inside whatever the Season. Those who travel with animals of companies outside 1 ° and 2 ° Cat. Can host their animals with Them. They must pay an extra charge of 6 euros per animal per night. Like all the other guests of the campsite, those who rent the Sunêlia Prestige 4/6 people also have the right to rent towels or sheets. They also have the right to reserve a cleaning service at the end of their stay. covered terrace (subject to availability).